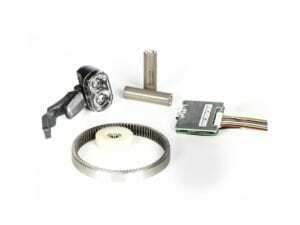 Why geared motors? Higher electric power can be achieved through higher RPMs in smaller size and lower weight electric motors. An embedded high efficiency, reliable, maintenance free Nylon sun-planetary gear system provide a great torque and power in a very small and light hub motor. 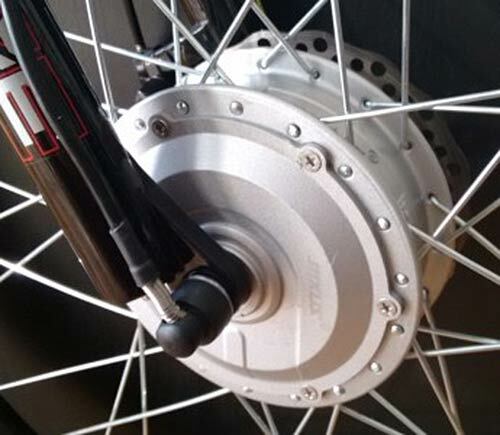 People rarely recognize this is a hub motor as it is a little bigger than a conventional bicycle hub or brake hub. 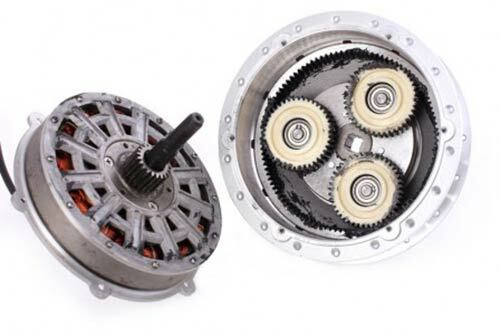 An automatic clutch keeps the wheel released while freewheeling and engage it only when you need a torque or power from motor; No noise and no sense of geared motor engaged in whole trip. Installation simplicity, light and small size, low moment of inertia, high torque and power is achieved accompanied with maintenance free reliability in hub geared motor. Motor electric power comes from a battery source recharged by a battery charger when plugged to grid. 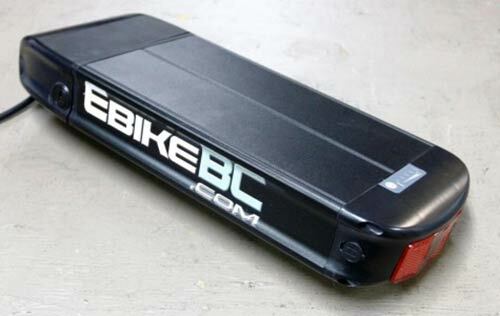 Primary ebikes used to use sealed lead acid batteries for the power source which were so heavy and low range. Some suppliers still propose using this type of battery on special rack mounted cases or body embedded cases to offer a cheaper option. 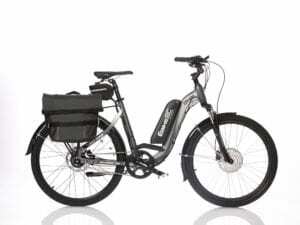 Since 2005 Li-Ion cells mass production brings this technology to ebike industry as it got more affordable. There are different types of Li-Ion cells now on the market with a huge variety of quality and brands and prices. Li-Ion batteries are a set of certain number of cells in a case which are connected paralleled or in series for certain Voltage and Amperage and are protected with special Battery Management System (BMS) to prevent cells from unbalance, under voltage, over voltage, over current which all can be harmful to vulnerable Li-Ion cells. No memory effect on Li-Ion battery means you can top off to a full charge at any time with a standard wall outlet using this charger. You should know that Capacity measurement methods in sealed lead acid batteries are different from Li-Ion Batteries; e.g. a 10Ah lead acid battery is comparable to a 6Ah Li-Ion battery pack with respect of ebike range and about 6 times heavier. In Lead acid batteries, there is usually a direct relation between charge state and the output power that makes power drop from full charge to half charge totally sensible. In contrast, Li-Ion will almost maintain the same output power till the end of it’s range. 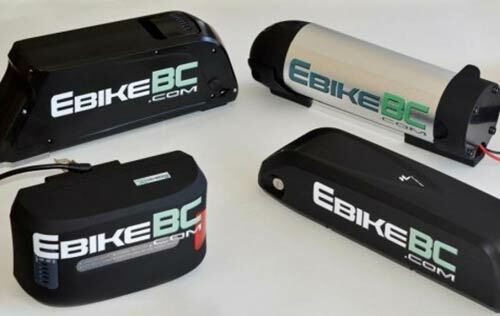 Battery usually takes the biggest share on the cost of an ebike kit. In case of Li-Ion it is almost 60% of the total cost of the kit. 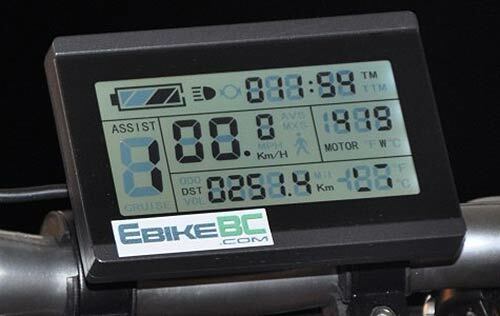 It is also very important for performance, safety, reliability and beauty of the ebike. 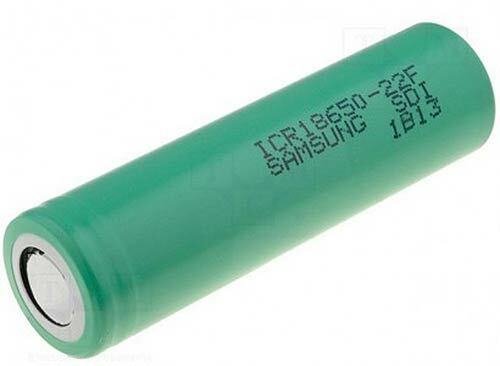 Li-Ion batteries are the most vulnerable and the most expensive service cost in case of a defect. That’s why many online ebike dealers do not supply battery on their kits. Battery cells of all kinds have an expiry date thus no matter if you use or store the battery the battery is getting aged and loses capacity. We don’t risk on cheaper battery cells. We know the warranty and after sales service cost of a cheaper cell will always exceed the initial higher price of an A type battery cell. We use Samsung or equivalent cells in our battery packs and we ship them in partial shipment via Air not to keep any in a warehouse. So they are as fresh as a fruit when you get it. Detailed specifications of our battery cells are provided to know what exactly you are going to buy. 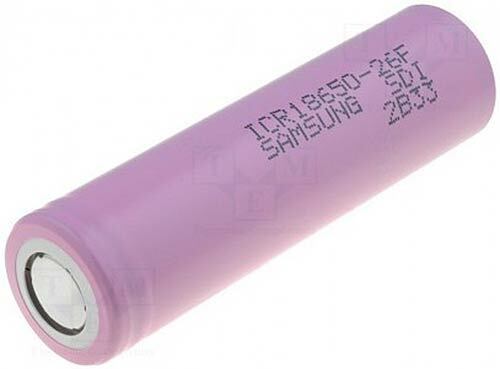 Battery cells we use in battery packs are mostly SAMSUNG 22F and 26F of LiMn technology. This technology is light weight with 500cycles effective life, best choice for ebike application. This is the same brand, model and quality control which is used in most ‘A’ grade laptops. Pack of 40 or 50 cylindrical 18650 cells has the advantage of maintenance-ability compared to polymer packs. Each 3.7V cell is continuously monitored and protected from over-voltage, under-voltage and over-current as well as 10 series cells voltage balance to guarantee maximum life cycle. 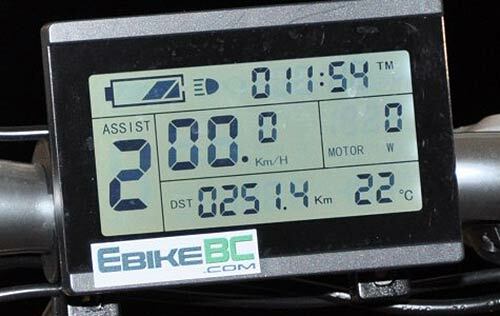 E-bikes require high initial torque and therefore models that use brushless motors typically have Hall sensor commutation for speed and angle measurement. 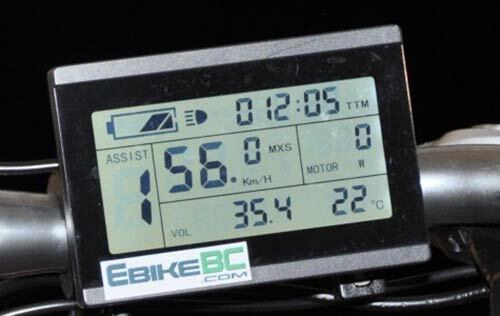 An electronic controller provides assistance as a function of the sensor inputs, the vehicle speed and the required force. 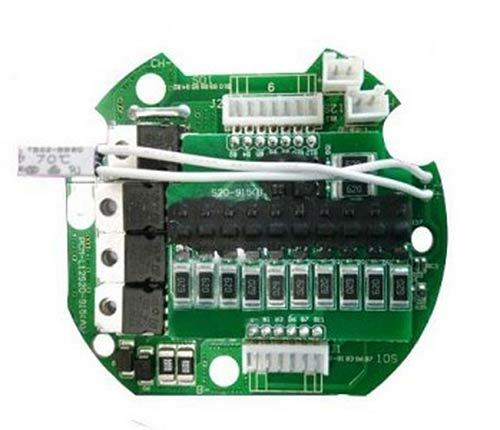 The controllers generally allow input by means of Hall Effect twist grip or thumb throttle, closed-loop speed control for precise speed regulation, protection logic for over-voltage, over-current and thermal protection. Electric bikes necessarily need an interface to switch on-off, set the level of motor power assist and see the charge status of the battery. 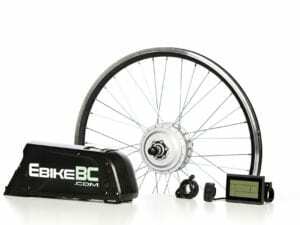 There are two options in EbikeBC conversion kits. Simple and easy with 3 keys for on-off, increase or decrease level of assistance for low-medium-high, charge status of battery in 4 LED lights. It is water proof and can be easily installed on the 22mm section of all bicycle handlebars. LCD meter provide you with a variety of functions such as vehicle controls and vehicle status digitized displays to meet the trip demands. Grid power is the energy source for the ebike system. 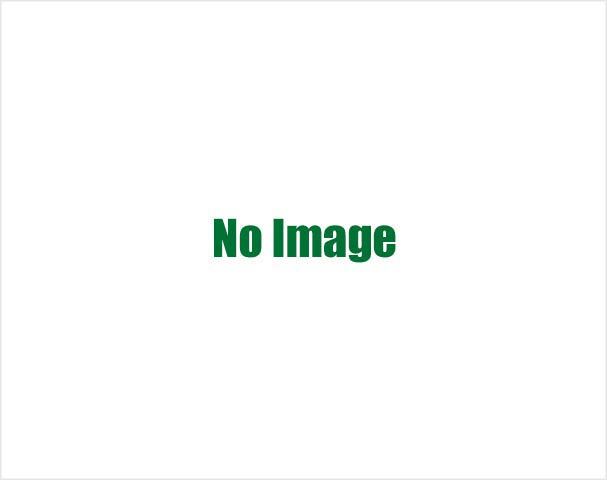 The energy is charged to the Li-Ion battery over night or any time not in use. 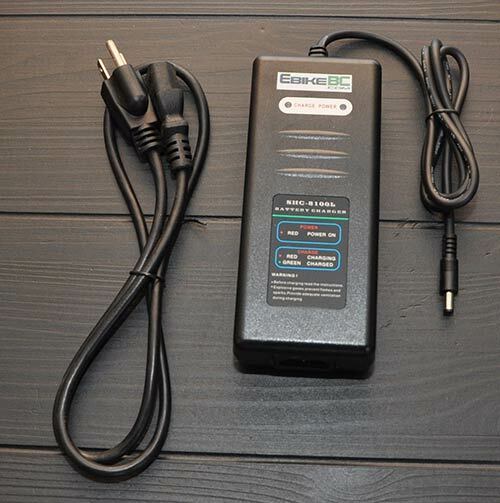 To ensure the best performance and highest life cycle of the battery only a 42V automatic Li-Ion battery charger is should be used for the recharge. This charger automatically follows CC-CV charging pattern. 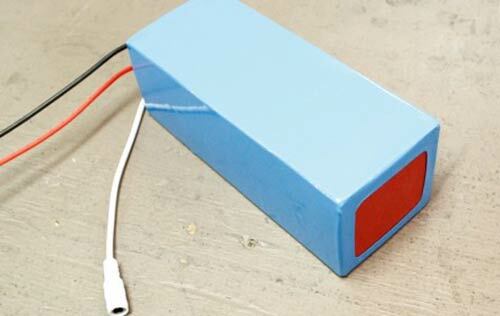 2A Constant Current until reaching 42V and then keeps Constant Voltage to reach near zero charge current. No matter if you forget to unplug the battery after a full recharge. Depending on battery capacity and system power and riding conditions, a full charge takes between 4 to 7 hours with normal 2A chargers. Cost of one full charge is less than 15 cents on your bill. A disc on the crank shaft featuring a ring of magnets coupled with a Hall sensor giving rise to a series of pulses, the frequency of which is proportional to pedaling speed. 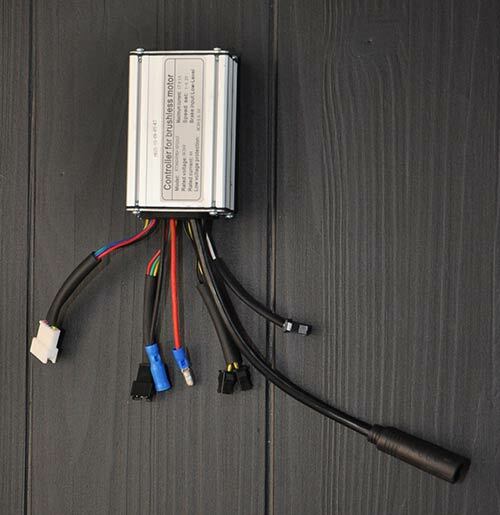 The controller uses pulse width modulation to regulate the power to the motor. It’s a hall effect thumb throttle that can linearly increase and decrease the motor power as well as speed. It can be install on right side of handle bar and requires to remove the handle bar grip to fit. 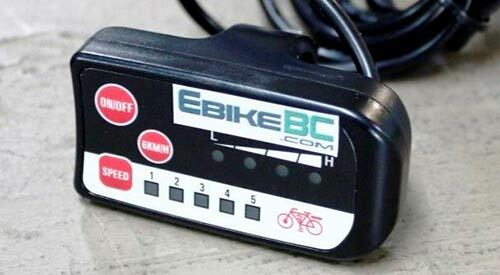 This component is also called “Power on demand” and is not an electric bike essential part, since the ebike system is activated by PAS sensor on the crank when pedaling. Motor/controller options are provided for regenerative braking but infrequent braking and the low mass of bicycles limits recovered energy. It only makes sense for the frequent long up-hill/ down-hill travels; not to regenerate and recharge the battery, which at best it can increase the range 10%, but to save bicycle brake pads and better bike speed controls. This option in our geared hub motors have a tiny disadvantage that the motor clutch is always engaged, even if there is not a request for assist power. There will be nearly unrecognizable noise and resistance for the rider when riding as normal bike.